Once you’ve got your 5 gallons of pure seawater, you’ll need about a full day to process it and several more for the final drying. After you filter it through a basic cloth dishcloth, you need to boil it down. At first you want to use the highest heat your stove is capable of. Once you’ve cut your 5 gallons of liquid roughly in half, you’ll want to gradually turn your burner lower and lower to prevent your salt from scorching. The more you boil your salt down, the more you’ll want to stir it. Once your salt is the consistency of wet sand, let it air dry in shallow pans. To speed air drying up, you can turn your oven to the lowest temperature setting and keep your salt pans in there. This final drying stage can take anywhere from a few days to a few weeks, depending on how much water is left in your salt and how much surface area is open to the air. Your final salt product can be stored in mason jars, salt shakers, or a bucket if you’ve gone all the way with your salt production. 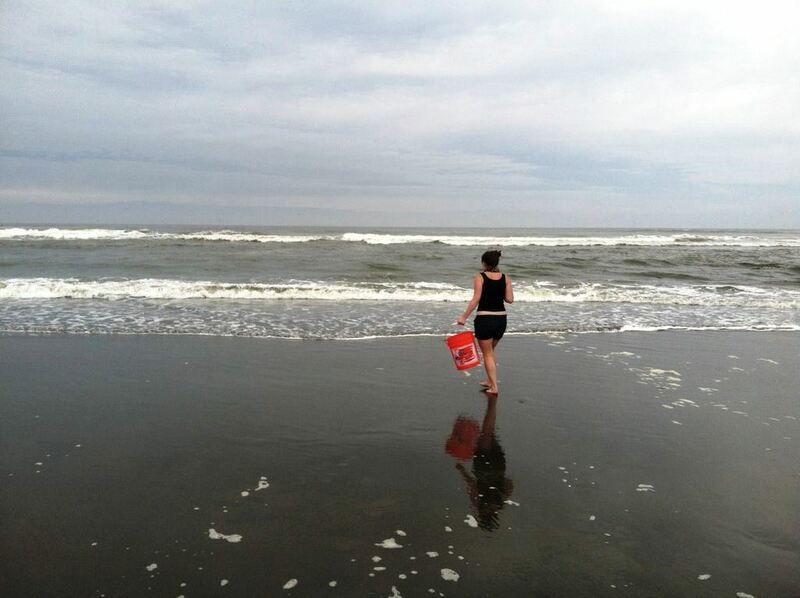 With five gallons of seawater, you can produce 3.5 pounds of salt. With this much salt, you may be best off getting your own cute little salt container for in the kitchen. This tutorial is a summary of the excellent How to Make Sea Salt published by Ben Fahrer on Instructables. If you’re interested in making your own sea salt, visit his article for much more detail into the sea salt process and pictures of every step. The pictures shown here are also courtesy of his article. What would you advise now that the Fukashima Nuclear plant is polluting the Pacific and it seems to be carried to the Pacific coast of the U.S.A.? You could…and this is a suggestion…educate yourself on exactly what is happening. Very few people realize what the difference is between radiation (not a huge problem, actually necessary for life) and contamination (can be a much bigger problem). You can’t “leak radiation” into the water, because it isn’t a physical thing. And as to contamination, the ocean (and, indeed, every body of water) has been radioactive since the beginning of time. In fact, so is every human, every living thing, most construction materials, and the gas expelled from the smokestacks of commercial power plants (coal, oil, all of them). I’m not saying the Fukushima disaster isn’t a disaster, or that we shouldn’t give it its due concern. But the CED (committed effective dose) you would get from the Fukushima plant if you replaced all the salt in your diet with sea salt harvested in Japan, would still be less than the dose you would get from the sun standing on the shore collecting the water. It’s all about perspective. “Halite” is the term for natural salt mineral a geologist would use. At what temperature does salt “scorch”? What happens to it when it scorches? 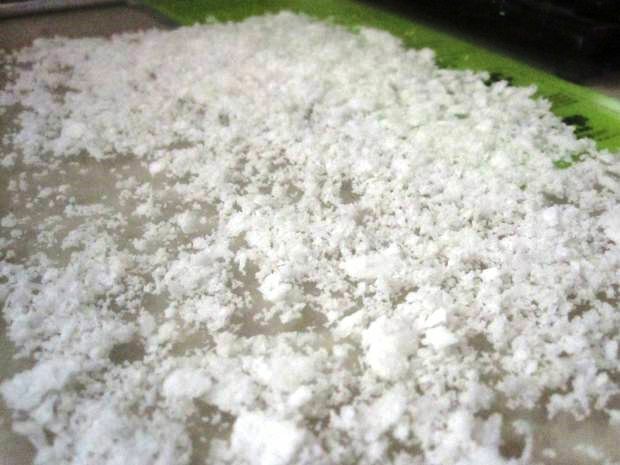 A hot, dry salt “bath” is often used to soften plastic to form it (e.g. eyeglass frames). Why not just use a water maker, which is simply a filter that is so fine that it actually filters out dissolved salts and gives you clean water. But in our case, we’d throw away the water and keep the salt.. They are far more cost effective than using heat to boil away the water. Or at least, use vacuum instead of heat to boil away the water (like they now do in the maple syrup industry).